How many times have you watched while the worship leader in your church has raised his hands skywards in praise to the Lord, only for his trousers to slide to his ankles at the same moment? Never? Me neither... but I live in hope. Watch and pray, dear brethren. Tragically, a new product on the market may prevent such a wonder ever taking place at all. 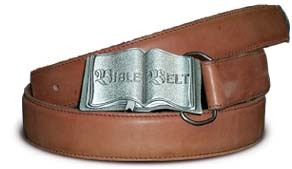 The Bible Belt, available from Malcolm White Productions for only $20, features a handsome buckle, enabling you to wear your fundamentalism with pride. Says one satisfied customer: "Lord have mercy, who among us has not heard of the Bible Belt all our cotton-pickin' lives? But nobody thought of making one to wear around one's waist until Malcolm White came along. God bless him! Praise the Lord! Send me three more size 40s, Malcolm!"